open the fridge and drink directly from a bottle of milk or orange juice then put the container back. 298=Why does ALWAYS seem to snow heavily every Christmas? 295. Cool people can use a classic car as their daily driver without breaking down all the time. All maintenance required is opening the bonnet and wiping your hands in an oily rag on a sunny afternoon. 299. Don't give robot children spinach. Okay. Thought it was just a movie thing as I don't know anyone who'd do that in my part of the world! 300. Loafers are standard issue foot wear for rocket crews. -Various 1950's sci-fi movies. 302. If your town is threatened by an imminent natural disaster or killer beast, the mayor’s first concern will be the tourist trade or his forthcoming art exhibition. Magnum P.I is perhaps the worst one for that. The whole point of being a Private Investigator is that your supposed to maintain a low-key inconspicuous presence. So why does he drive around in a bright red Ferrari the can be seen and recognized from miles away? 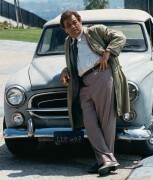 Then again... Colombo's Peugeot always had problems, it never ran well.